Bits & Scraps Of My Life: Hello Summer!!! Hello my crafty, scrappy pals! Today marks the first full day of summer break! The kids had half days yesterday and today we had to go back out and pick up report cards. As expected my 13 yr old has to repeat 7th grade. This kid failed health/pe!!! That takes real initiative.....lol. I told him today that next year things are going to be different. We can't change this past year but we can learn from it. Hopefully!!! He was really surprised that I didn't yell, or scream of ground him for another few weeks. I'm tired......seriously. This kid has exhausted me this year and I'm hoping the summer break will do us both good. I have the kids sitting right now and writing out summer wish/bucket lists of things they want to do or places they want to go this summer. Money, unfortunately is an issue for us this summer so Disney Land likely won't make the cut.....lol. But we are blessed to live in East Tennessee and there are tons of outdoor things to do! I've also been researching and found that if you have a Regal Cinema in your area, over the summer they will be having dollar day twice a week and be showing G and PG rated movies. Super cheap day out with the kids! Also many bowling alleys are offering free games per day over the summer.......it beats letting them sit in the house and yell at each other all day....lol. So all of our bucket list items will go into a vase I'm decorating (pix will follow soon!!) and we will draw something from it a couple times a week. So far we have things like try new recipes (they will choose their own recipe from pinterest) make a garden, go fishing, picnic, farmers market, flea market........wish me luck....lol. 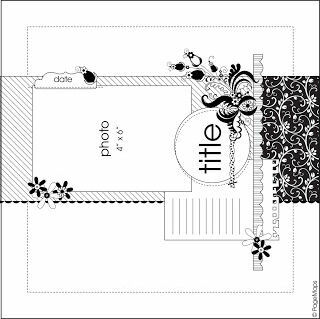 I have several scrappy layouts to share with you today. So I have been creating, just haven't had time to blog them....lol. First up is this page for PageMaps Anniversary celebration. I decided to flip this sketch on it's side and use it like this......and the twist is to use it as a boy themed layout....um, easy for me cuz I have five boys....lol. I adore this photo of Jesse from a couple of summer's ago. Just look at that face!!! I used this awesome digi kit from Secret Stash called Authenticity. I love the elements and colors and its pretty much perfect for scrapping boys or girls! 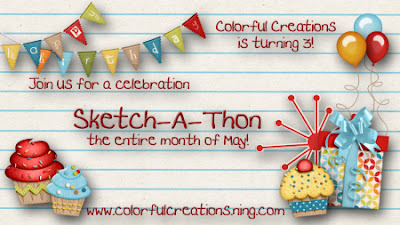 Next I have this one I created using the Colorful Creations Sketchathon sketch...its still going on and will thru out the month of May! They choose this sketch, which incidentally is another bunch of PageMaps Awesomeness!! And my take, staying really true to sketch.......this is Jesse and Brandon from last summer at a local fountain. 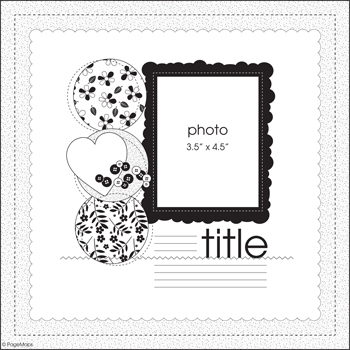 For this one I used this fun kit from Shabby Pickle.......loveeeeee this!!!! I'm entering this one into a couple of additional challenges. 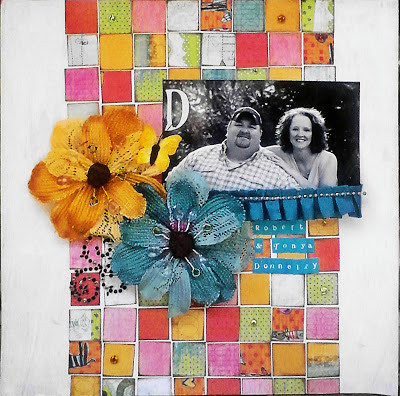 Allsorts Challenge Blog True Blue, use blue as the dominant color on your project. Inspired By this photo inspiration...I chose the color palette. This first one was basically a stash busting project. I had a bunch of Prima sample papers that came in a prize package I had won some time ago...they were all 6 x 6 and had a grommet thru them. I finally decided to take them apart and save a couple for cards and use the rest for layouts or the altered art thing that is so hot right now. I tried to get a lil funky and I painted the cardstock and had Jesse ink all of these scraps for me.....lol. He did awesome too btw!!! And now he is inking everything in sight...I created a monster! I also added some AC Thickers and Prima bling and flowers and Zva Pearls. Different for me but I love how it turned out! 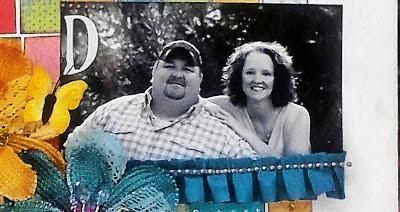 The photo is of my Cousin Tonya and her Hubby Rob. 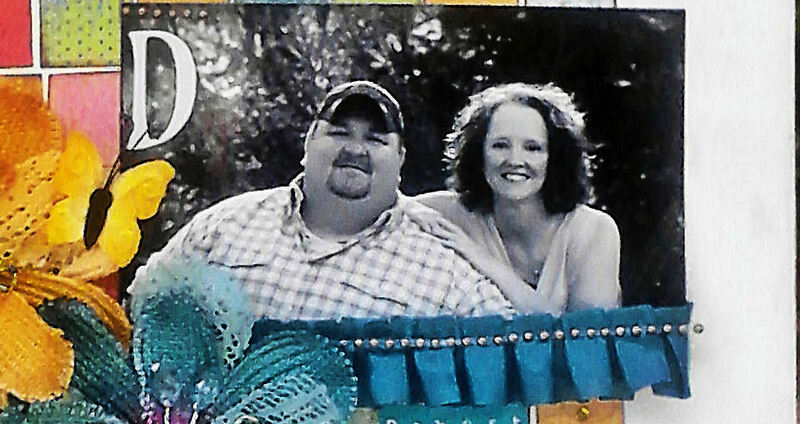 I need newer pix because he has lost 47 lbs!!!! I thought the black and white photo was perfect for the colorful backdrop! And I was not in love with those flowers but they look perfect here!! The pearls are along the ribbon and the top corner of the photo. Red Carpet Studio: Girl with the pearl earring, use pearls on your project. I combined it with the Challenge at Child's Play which is "trouble" Something as the mom of five boys I know a lil something about....lol. 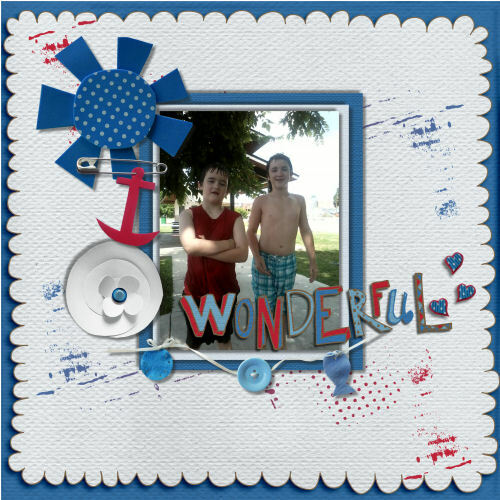 I scrapped Brandon and jesse again using American Crafts Ready Set Go collection and got to use up some of my sticker stash I still have from that collection. I was kinda unsure at first about this one but I really like how it turned out. And I'm having a blast playing with paint!! Thats it for today! Arent you glad? lol. It's getting ready to rain and I need to get a walk in before the down pour hits. Y'all have a great day!! your digis are really cute. I really love your paper layouts! very fun! Look at all of these wonderful pages! Thanks for playing at Inspired By. So sorry that he has to repeat the 7th grade!! Can totally relate as Adam still struggles in school... if it wasn't for ROTC ... I'd think he'd be lost ... LOVING your pages!! LOVING that grid design on that last one!! I love all of these!!! The one with the paper squares is prob my fav, but they all rock! We have been saving like crazy for a Disney World trip this summer and now with everything going on with my littlest sweet pea's health issues I'm not sure how we are going to make that happen. 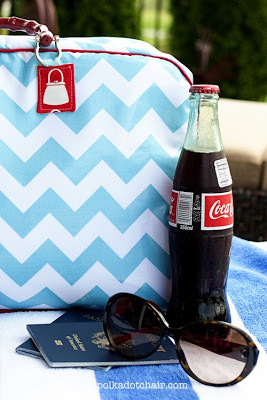 Luckily with Pinterest I am invincible and they just have TONS of free/cheap summer ideas you can put together and we have a list of our favs to try!!! 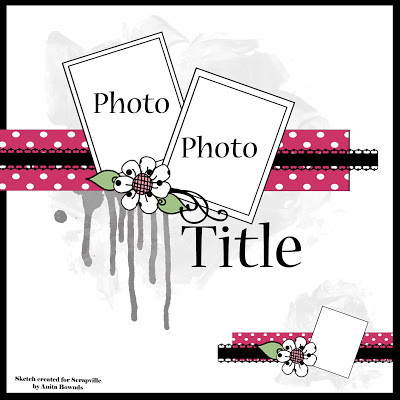 I love the patchwork quilt effect on layout you are submitting for the alphabet challenge at Lasting Memories. Thanks for sharing, it's amazing! Fabulous LO for Scrapville using Anita's sketch...love that yellow in the background making your photos & embellies pop. Great take on the Scrapville Sketch Tina. Love your colours. The paint looks great on your layout.Thanks for joining us at Child's play challenges. I enjoyed all your layouts of course the trouble one is my favorite. great pages and wonderful work!!! 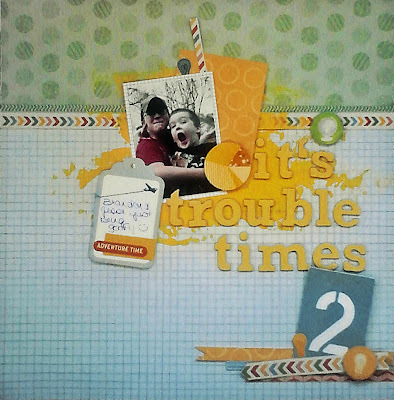 LOVE the fun trouble page and title work!! thanks sooo much for joining us at Child's Play Challenge blog.. So good to have you back (I know I haven't dropped by and I'm a bit late in saying this but still....) Lordy you have been busy - so many cool Lo's, My fav is the very cute photo of Jesse from a few yaers ago - love that Lo! Tina. Thanks for joining in with us at Scrapville. Yellow is a fave of mine and I love the paint work. Really great page. Hope you join us again.